One of the real perks of staying at Pillar Point RV Park is the availability of fresh, local seafood. Whether buying from the fish market at the harbor, right off the boat from the fisherman who caught it or catching it yourself right off the jetty, fresh fish and seasonal crab are bountiful. and their market price, use the FishLine app. The app is free and you can have it on your phone wherever you go! It's Crab Season at Pillar Point RV Park! Hundreds, if not thousands of people have streamed into Pillar Point RV Park and the surrounding area as sport fishing dungeness crab season officially opens. And, they are hauling them in today, along with Rock Cod and other fish. It's an exciting day and we'll be updating this post to tell you more about it. Half Moon Bay, CA - Pillar Point RV Park - What's For Dinner? While there are a whole host of wonderful restaurants, many within walking distance of Pillar Point RV Park, there's nothing like throwing fresh fish, caught that day, on the grill. Getting your hands on a fresh fish is easy here and there's several ways you can do it. 1. 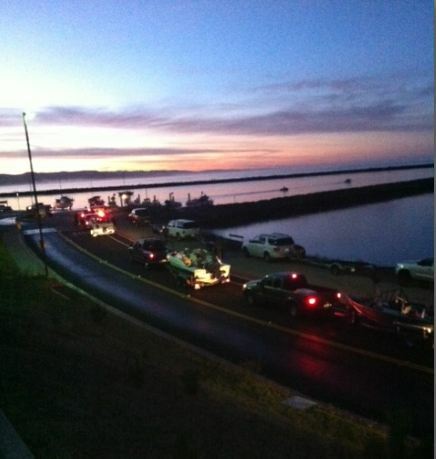 Go out on the jetty to catch one OR use the Boat launch a block away to take out your own boat. It's only $13 to launch. Self serve.